As if last season's squad wasn't strong enough already, the reigning European champions are coming into this new season reinvigorated with several world-class signings. If none of last year's key players leaves during this transfer window, this might very well be one of the strongest squads Real Madrid has ever formed. Can too much talent ever become a problem in a football club like Real Madrid? 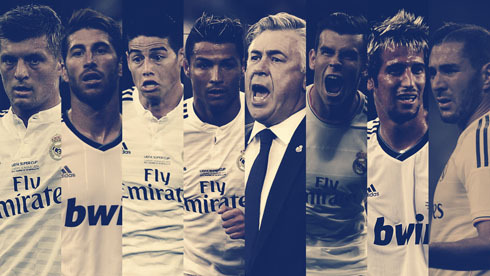 Over the last decades, the Merengues haved accustomed us to form truly galactic teams by signing some of the biggest stars in the game, season after season. It will be no different this year, especially after the likes of Toni Kroos (Bayern Munich) and James Rodríguez (AS Monaco) have arrived to the Spanish capital in order to strengthen even more a team who has already been crowned European champions just 3 months ago. How will Carlo Ancelotti handle the required rotation of so many talent? Will he be capable of managing so many egos at once inside the Merengues' locker rooms? Real Madrid visits Atletico Madrid this Friday night for the Spanish Super Cup 2nd leg and at such an early stage of the season, it's still very hard to predict how the Merengues will line up. Real Madrid's latest signing was precisely a new goalkeeper to compete with Iker Casillas for the starting spot. The Merengues decided to sell Diego López to AC Milan last week, but they tried to compensate that loss by bringing in Keylor Navas from Levante, after agreeing to pay 10 million euros for the Costa Rica international. However and judging from what we've seen so far, it seems that Ancelotti has been prefering to play Casillas ahead of Navas, at least during these first games of the season. The Spanish goalkeeper doesn't have much more margin for error though and unless he regains his old form back, it should only be a matter of time until Navas claims the starting spot. There shouldn't be many changes in Real Madrid's back four for the season ahead. The left wing should be handed to either Fábio Coentrão or Marcelo, even though at this point, the Portuguese does seem to be the most reliable choice. In the center, Pepe and Sergio Ramos should take over their usual defensive duties, while Nacho and especially Varane will have to be patient in waiting for an opportunity to show what they're capable of. On the right, the pick will most likely go to Carvajal, leaving Arbeloa with a more secondary role for a second straight season. Real Madrid's biggest overflow of talent comes to surface when we look at their midfield options. It's true that one or two players might still leave the club before the transfer window closes at the end of the month of August (Di María and Khedira being the most probable ones), but looking at things as they are right now, it's pretty obvious that there are still too many good players for very few spots available. Nevertheless and bearing in mind that there are only 3 slots open in Real Madrid's typical 4-3-3 formation, we may get lucky enough to see a very strong midfield being formed by Luka Modric in the defensive midfielder role (pivot), Toni Kroos playing near him but with a bit more freedom to advance on the field and then Angel Di María splitting his tasks between the usual defensive actions required to any centre midfielder and Madrid's lightening attacks. As we've said before though, there are obviously many different ways for Real Madrid to form an intimidating midfield for next season. Playing with Modric, Kroos and Di María necessarily means that Xabi Alonso, Khedira, Illarramendi, Isco and James Rodríguez won't have a starting spot in their natural positions. That is, however, the most balanced and talented midfield trio that Carlo Ancelotti probably has at his disposal right now. The depth in this Real Madrid squad is truly impressive though, so don't get surprised if the Italian manager decides to rotate these particular players quite often throughout the season. There's an old saying that states that you shouldn't change a winning team. If that could indeed be applied to Real Madrid's back-four sector, then it sure also deserves to be used when it comes to the Merengues's attack. Gareth Bale, Cristiano Ronaldo and Benzema have basically demolished pretty much every defense they've been put in front of last season and unless any of these players run into injury problems, they should all be in the starting lineup in almost every game. As for the necessary rotations, Jesé Rodríguez comes up as the most natural alternative to Benzema, while Ronaldo and Bale will be given some rest here and there thanks to the versatility of midfield players like James Rodríguez, Di María and Isco (who, at times, might also play as centre forward). Cristiano Ronaldo next game for Real Madrid will be against Atletico Madrid, for the 2nd leg of the Spanish Super Cup, on August 22. You can watch Juventus live stream, Atletico Madrid vs Real Madrid, Barcelona vs Elche, Chelsea vs Leicester City, and Everton vs Arsenal live, and Bayern Munich vs Wolfsburg, all matches provided from our football streaming pages.